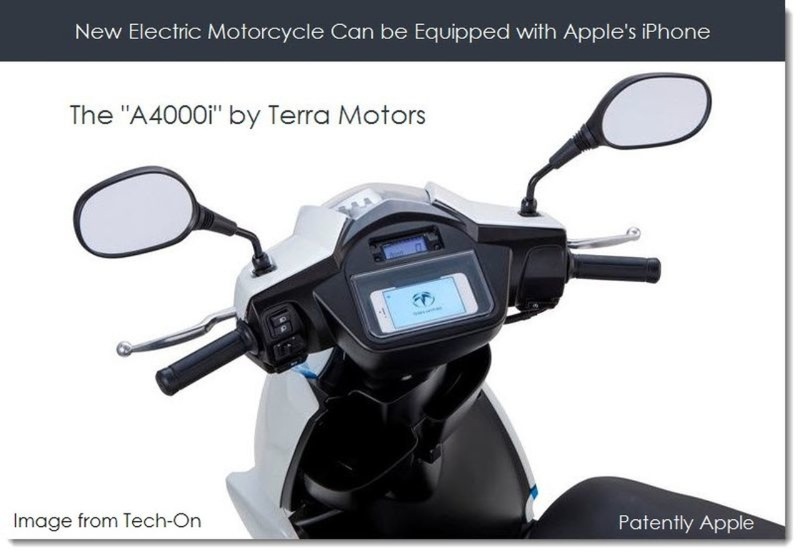 A new electric motorcycle developed by Japanese venture firm Terra Motors Corp has the ability to support and function together with an iPhone, PatentlyApple reports. Called the A4000i, this $4500 electric motorcycle can host an iPhone in front of the driver’s seat, allowing for monitoring the charging status and mileage of the motorcycle, in addition to recording motor load and its position for checking later. The Japanese firm is planning to add a navigation function and dispatch control function for business use in near future. A new service using data on driving history is also planned for future release. Terra Motors plans to release only 2000 units of the A4000i by the end of 2013. After that, it will start volume production of the motorcycle, planning to sell it across Asia. The report describes the motorcycle as being able to travel at a maximum of 40 mph (65km/h) as is powered by a detachable battery that could be charged with a household power outlet (100V or 200V). It takes 4.5 hours to charge the battery. And the life of the battery is 31,000 Miles (or 50,000km). The replacement battery unit is currently sold for about $1000 US. The price is expected to drop after three to five years when the life of the current battery expires. The company is expecting to sell 100,000 units of the motorcycle within the next two years.